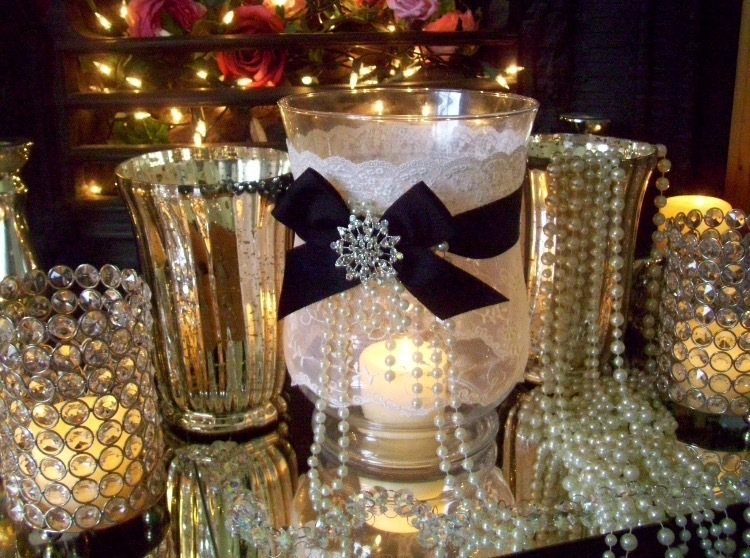 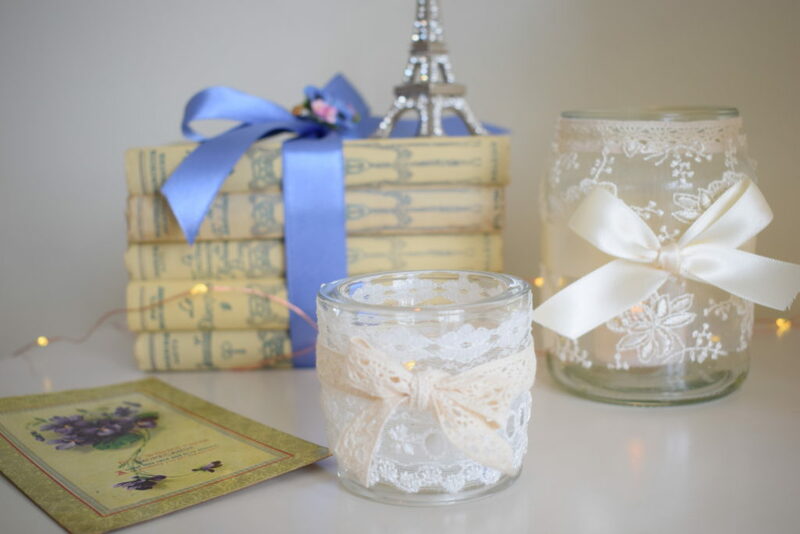 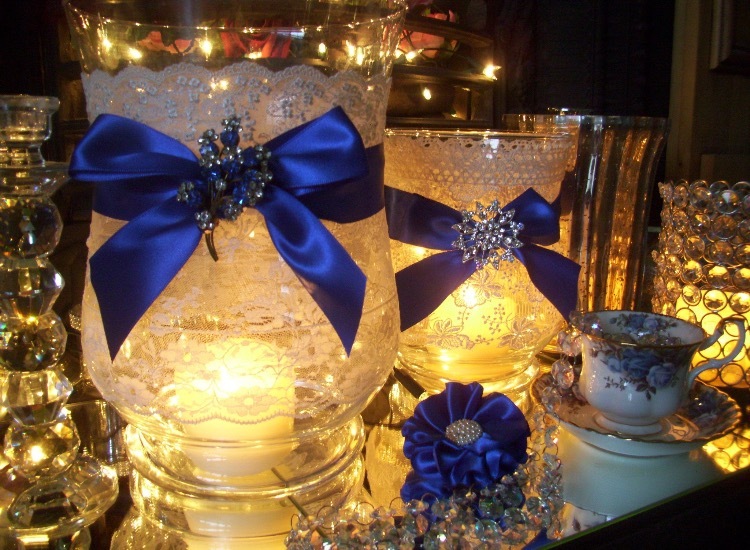 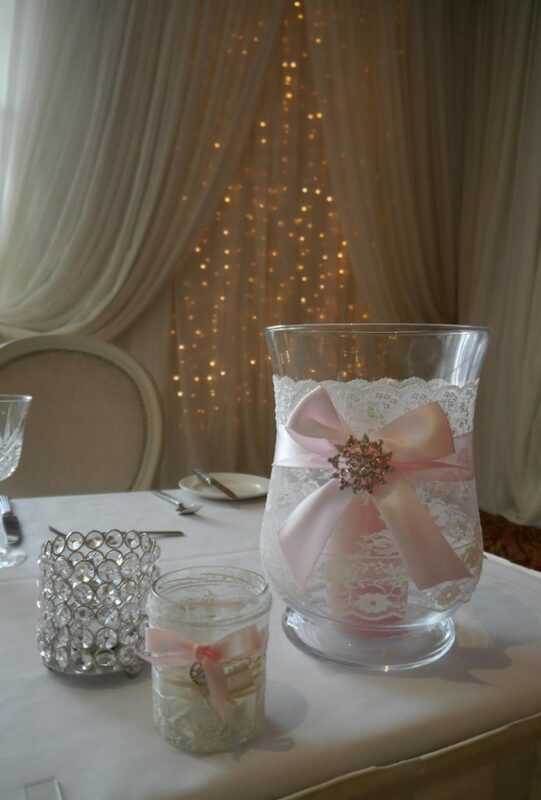 The first lace lanterns I ever made were for my daughter Rebecca’s wedding. 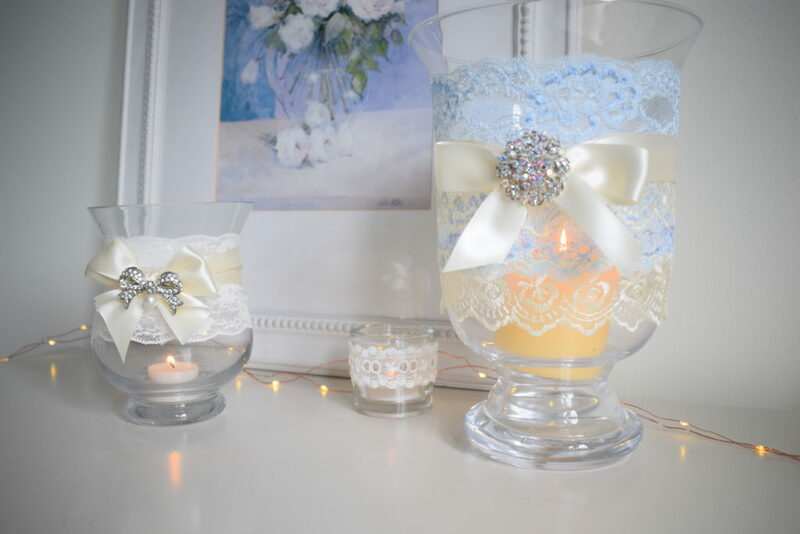 I was making lace corsages for the bridesmaids with lace left over from their dresses and suddenly had a flash of inspiration and decided to cover some of the glass lanterns for the top table with the leftover lace. 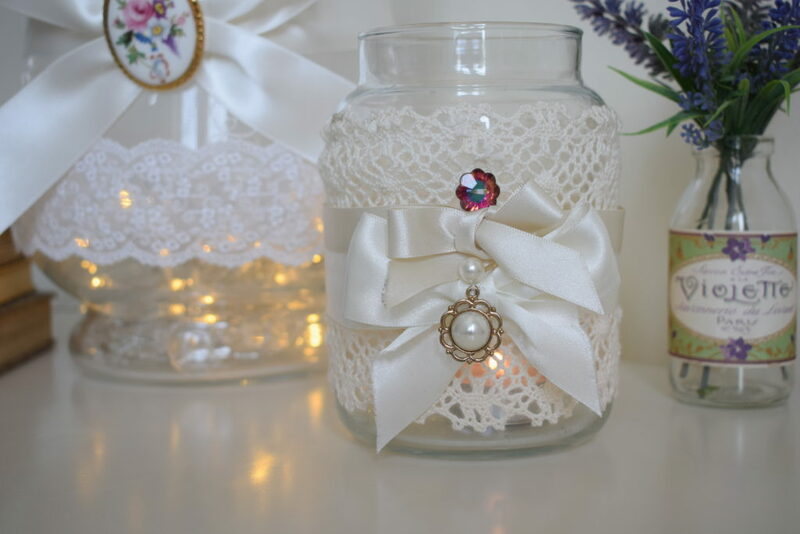 I’d never seen it done before but thought it would be simple enough to do. 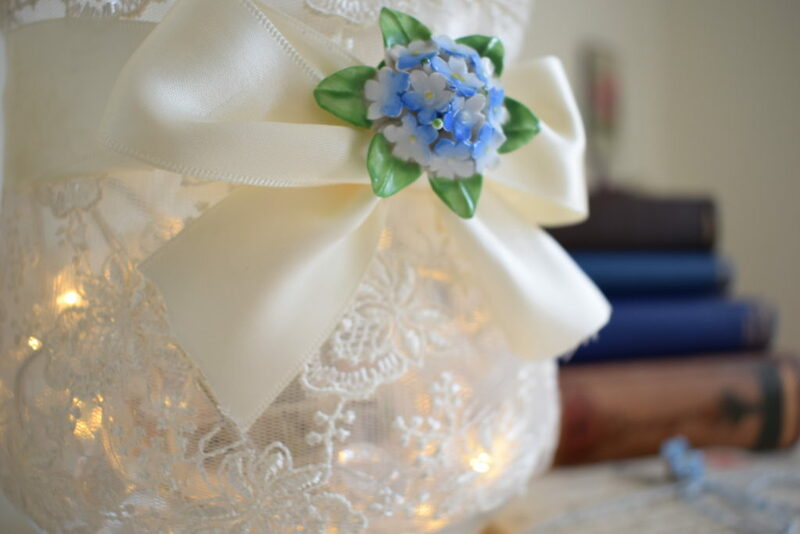 I measured out the lace to fit round the lanterns and held it firmly in place while I hand stitched a seam down the back. 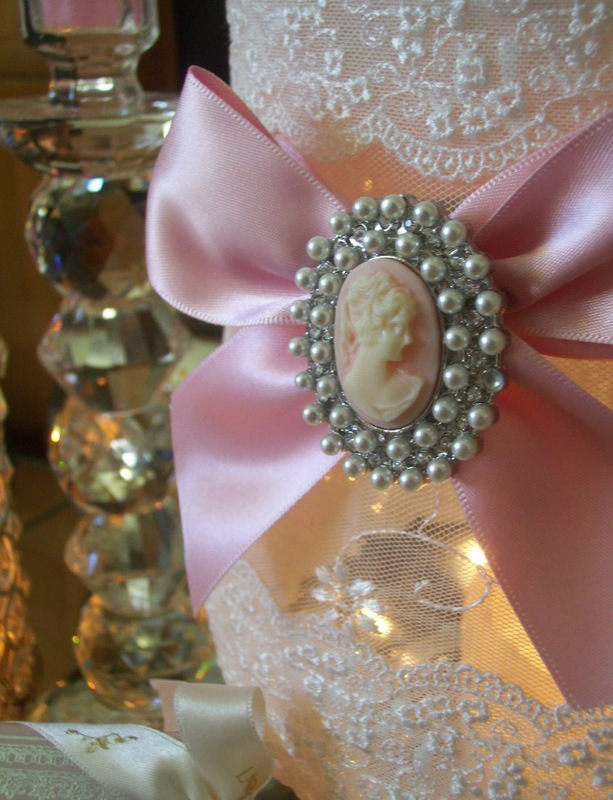 If you follow the pattern of the lace whilst stitching you can disguise the fact that you have stitched it together. 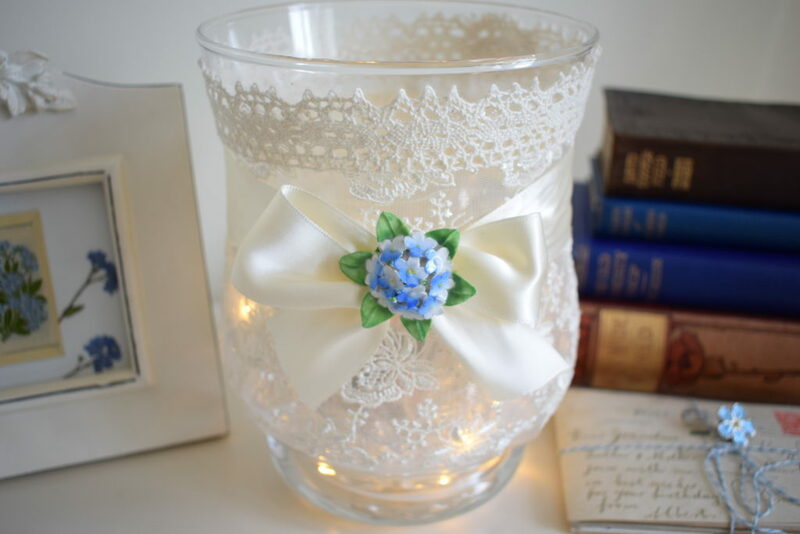 I prefer not to use glue as I think it can look very messy and also is difficult to remove if you decide to change the lace to something else afterwards. 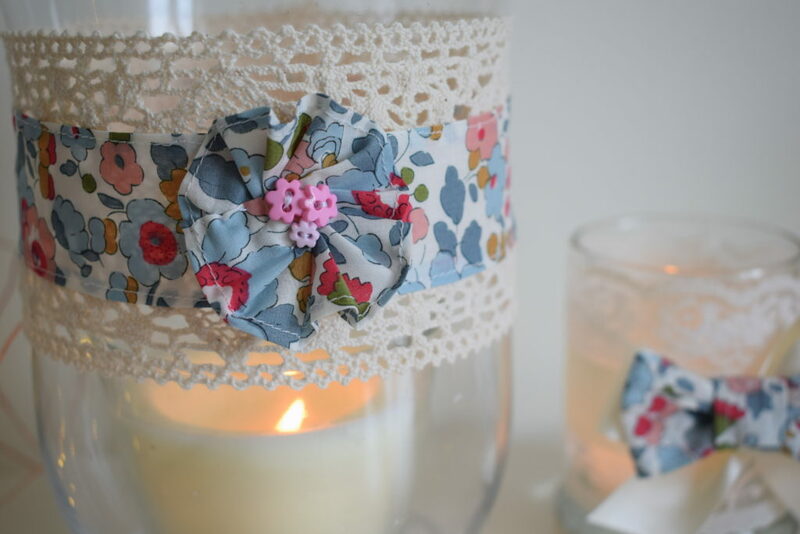 Once the lace is firmly onto the lantern you can then add ribbons and embellishments as it is easy to stitch these onto the lace. 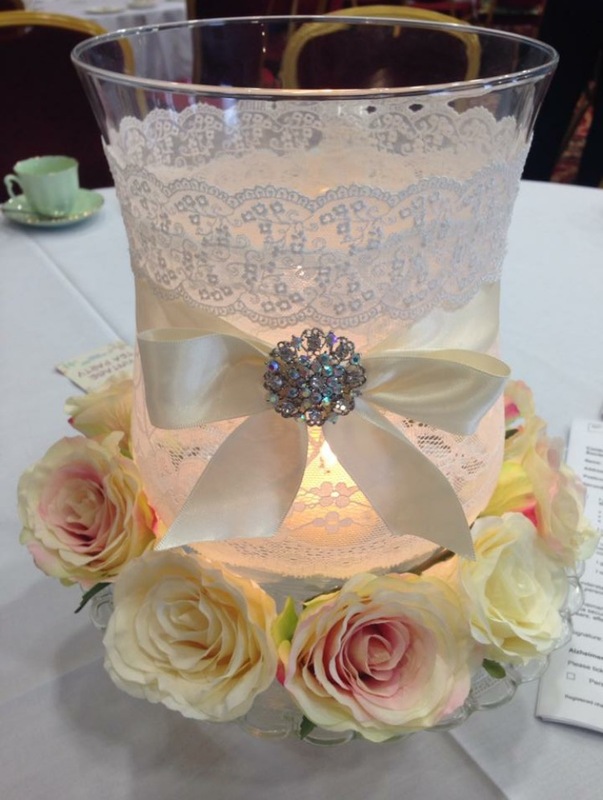 These lace lanterns have proved extremely popular over the years and I have made them to order for clients all over the world although I now prefer to make them exclusively for hire for weddings and events. 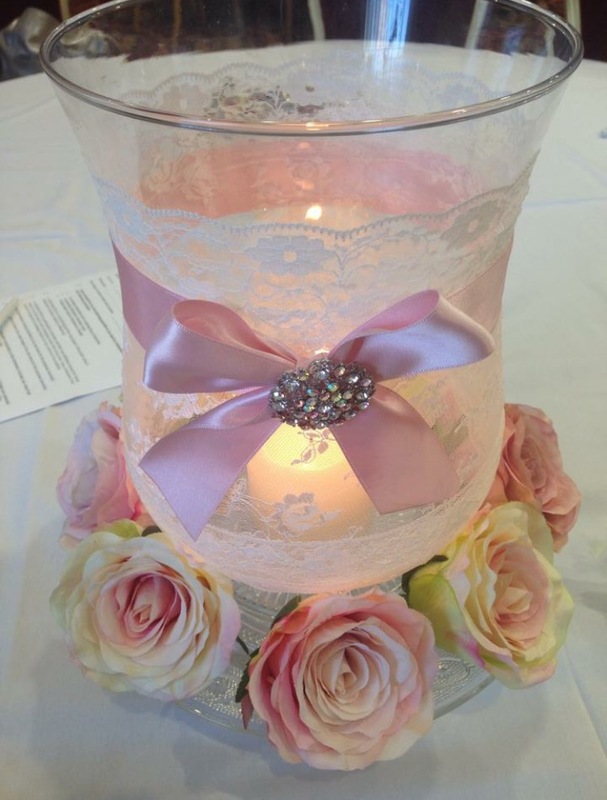 I have noticed many copies of them on FB etc but feel that it’s just one of these things as when we put our ideas and designs online it is nice that people take inspiration from them, although I did see one of my own pics of my lanterns on Pinterest and it was another wedding company offering to recreate the look for their brides which I thought was a little bit cheeky! 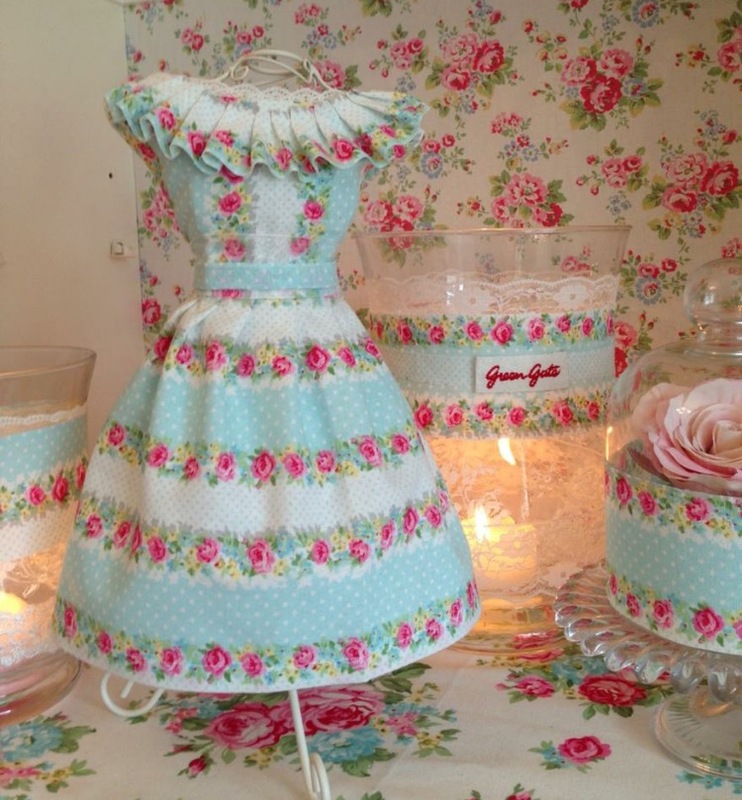 I often incorporate floral fabrics into my designs and especially love using Liberty, Greengate and Cath Kidston prints as they fit the vintage theme perfectly. 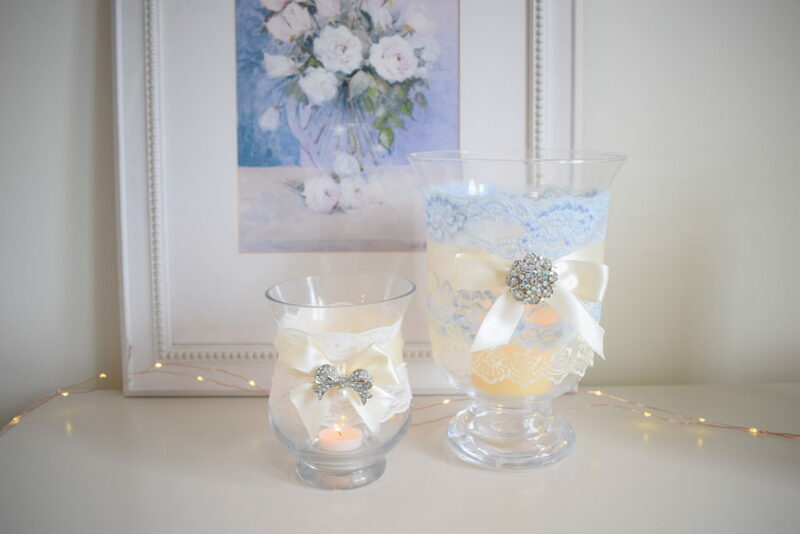 Lots of brides like the lanterns to tie in with their chosen themes and colours and this is very easy to do by colour matching swatches of fabrics to ribbons etc. 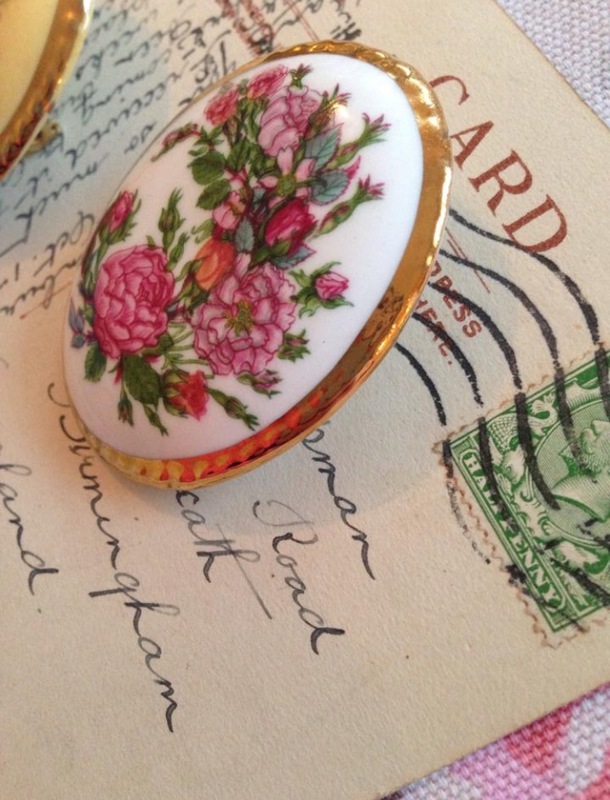 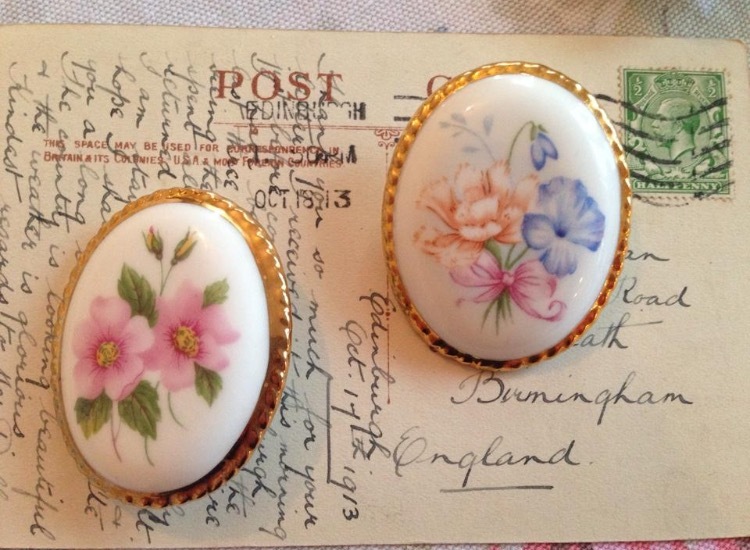 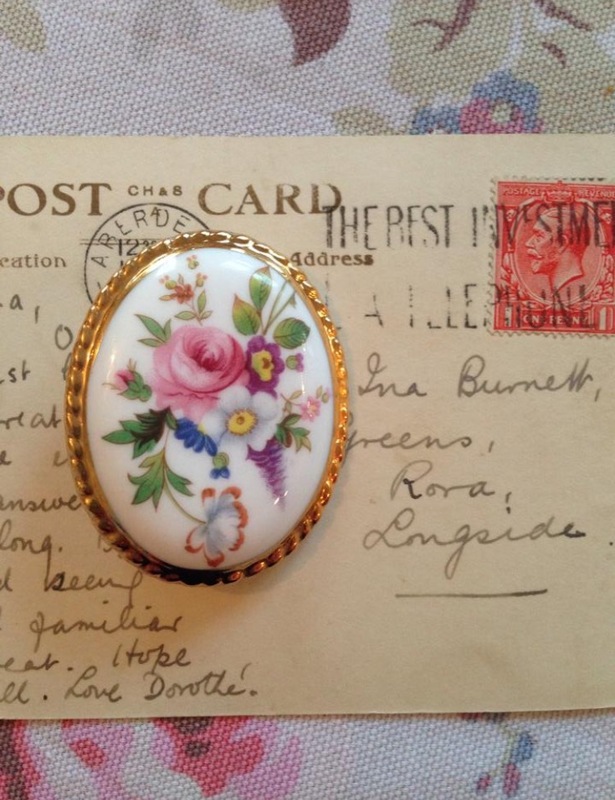 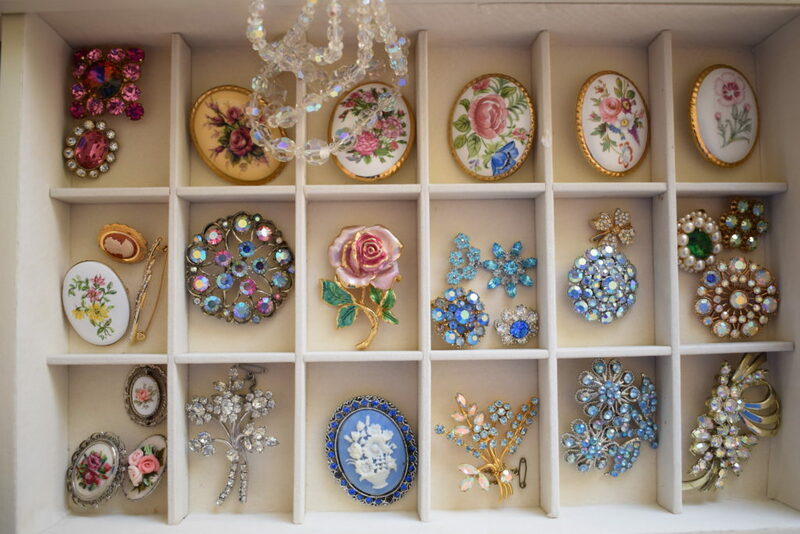 As I have a large collection of vintage brooches these are the perfect finishing touch and brides love to choose which brooches best match their wedding style. 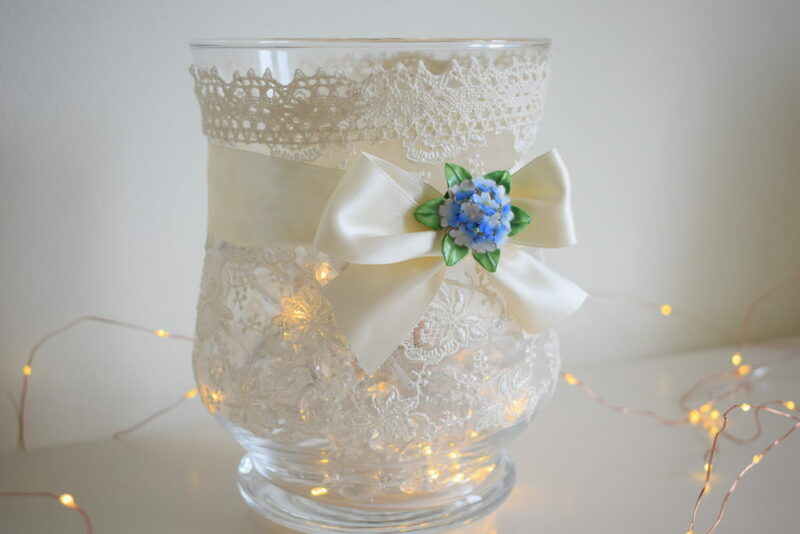 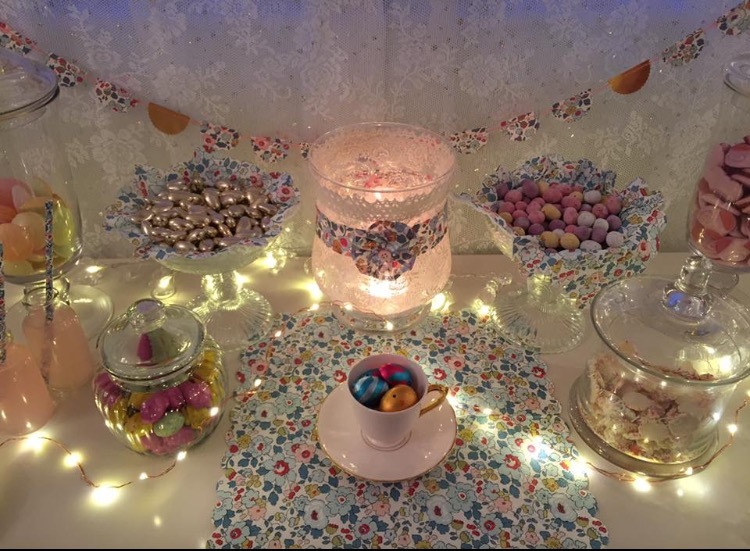 When I worked with the Alzheimers Society setting up vintage displays and afternoon tea parties I decorated some lanterns with vintage forget-me-not brooches as this is the symbol for their charity and they were so pleased with these little touches. 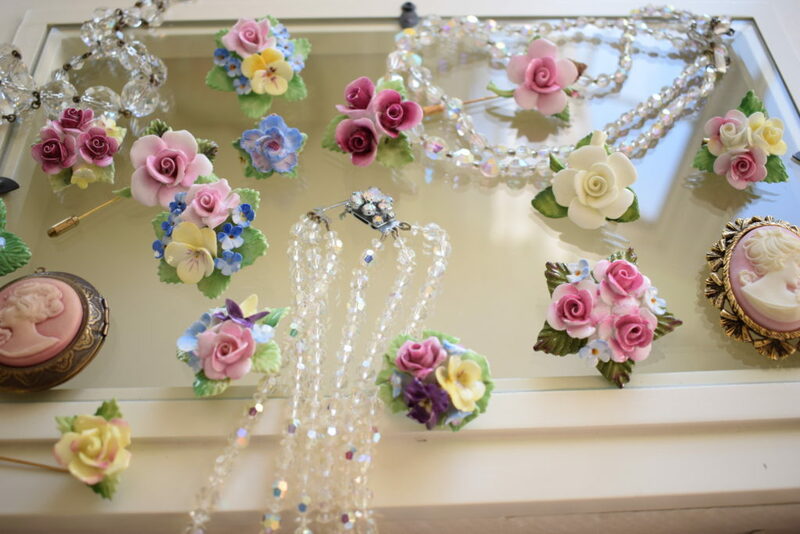 There are definite trends, with some brides preferring the very vintage floral brooches while others like the more glitzy sparkly ones. 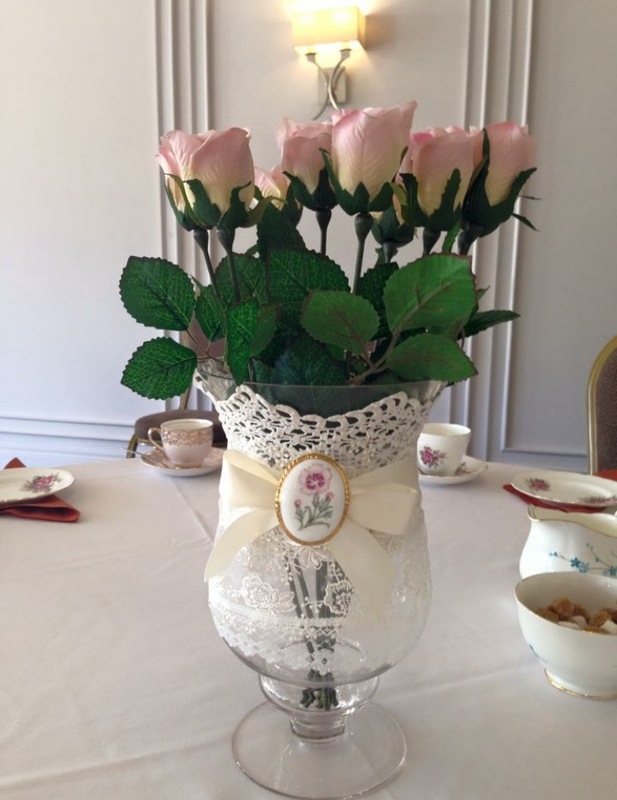 For celebrations such as golden weddings and special birthdays the oval shaped porcelain Aynsley ones are always very popular. 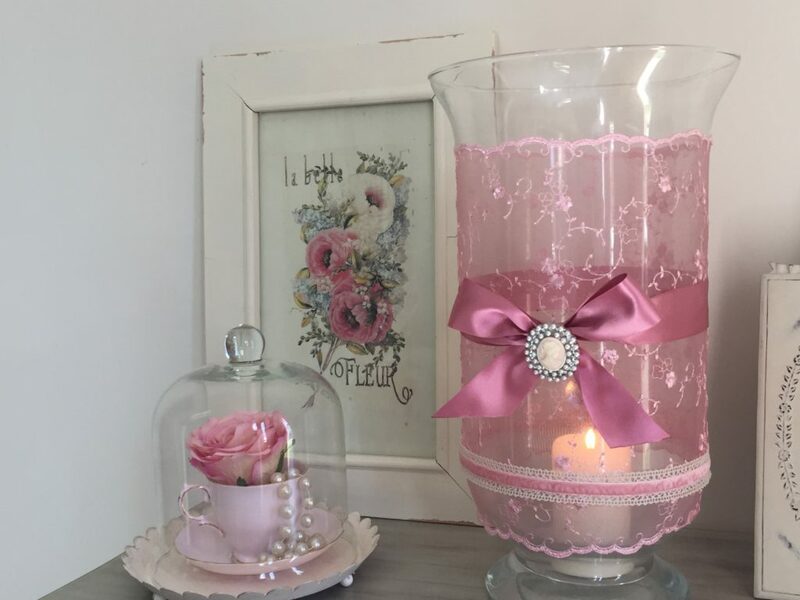 There are many different ways to style the lanterns and they are lovely either filled with flowers or with a candle or fairylights inside. 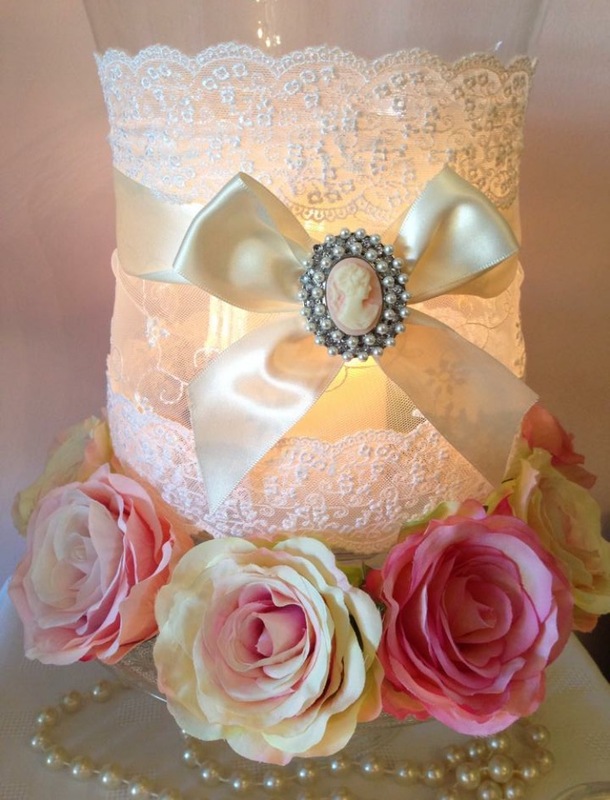 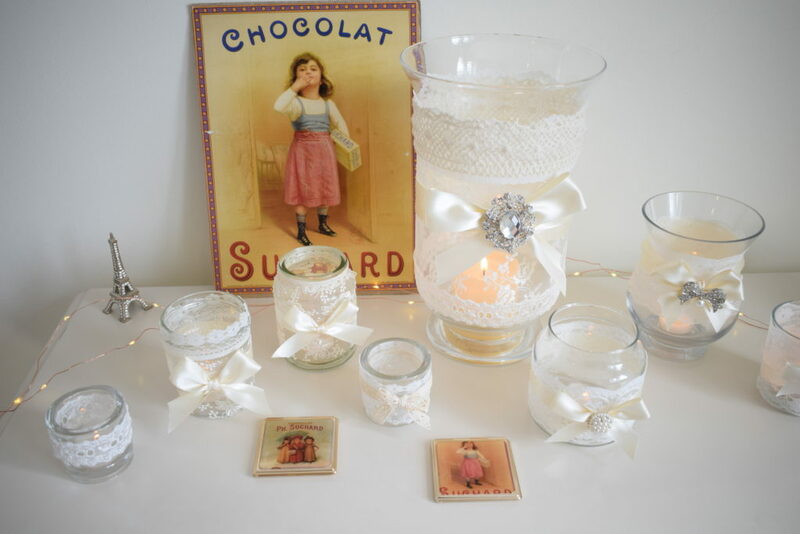 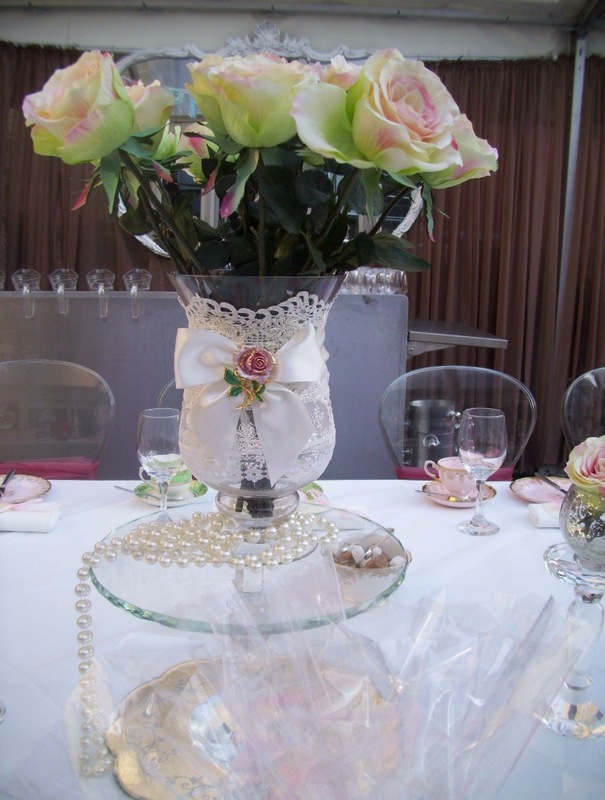 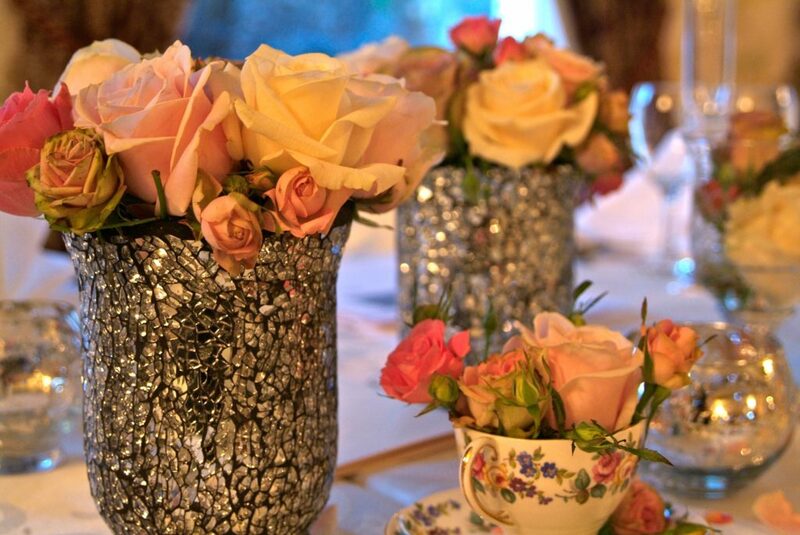 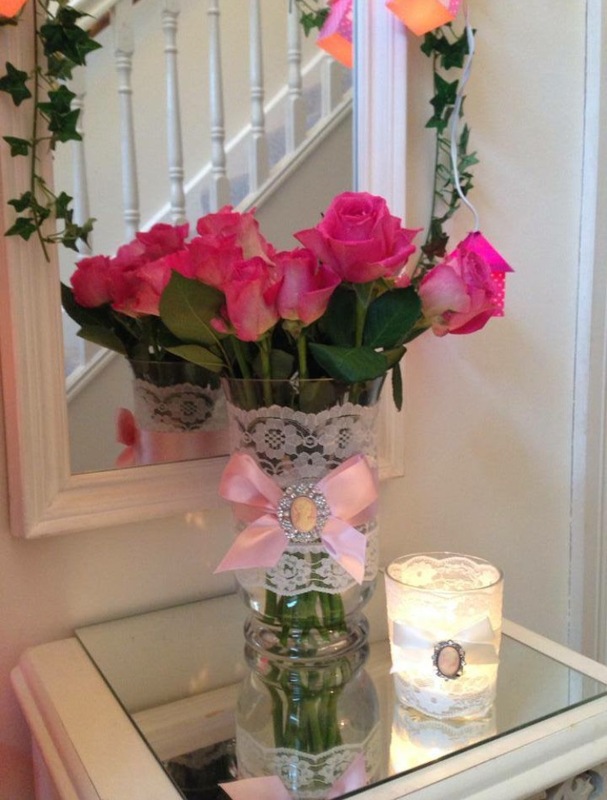 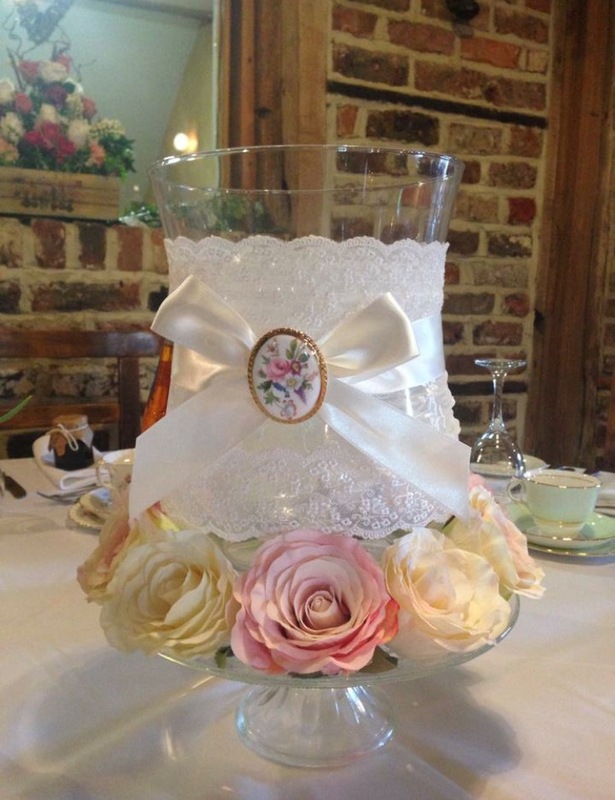 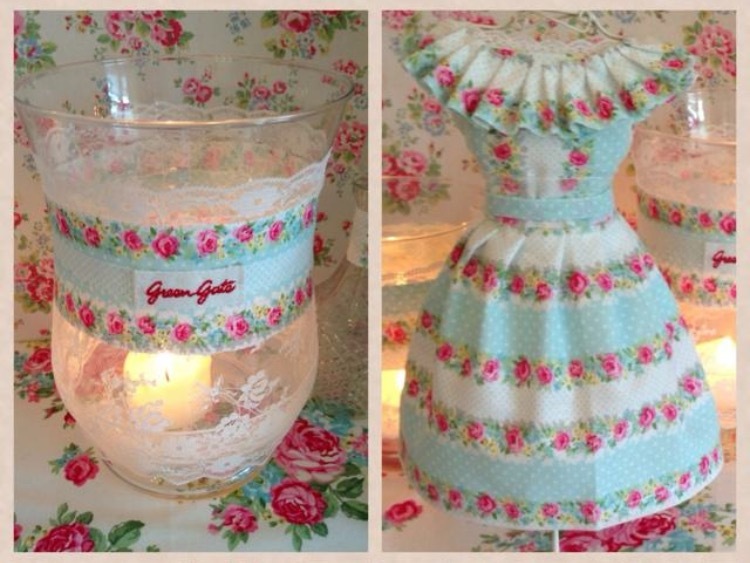 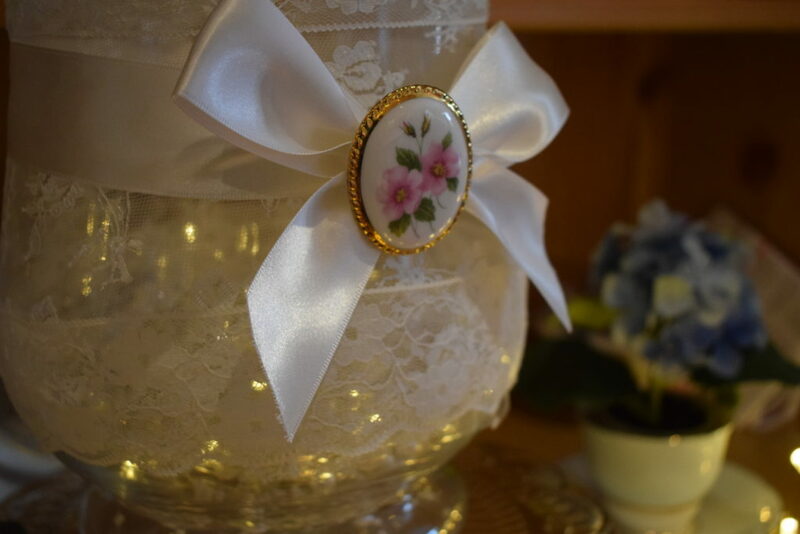 They can be displayed on a mirror or vintage cake stand with flowers round the base. 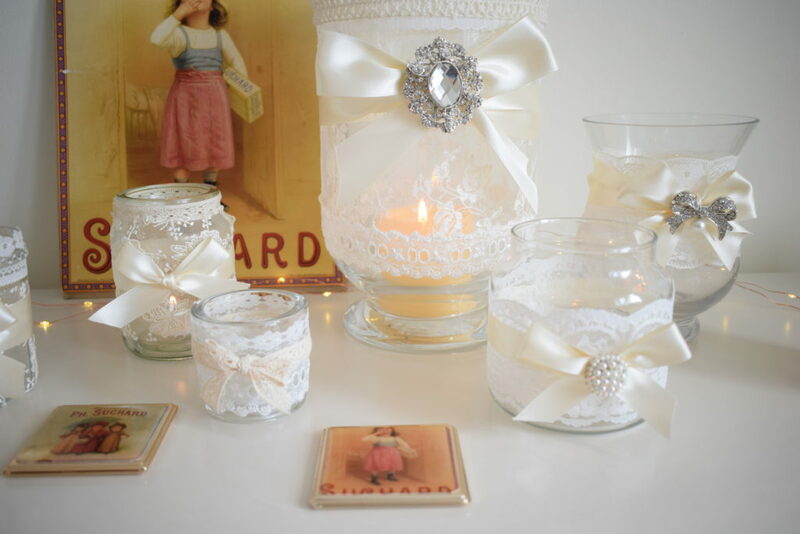 It’s all just a matter of personal preference and style. 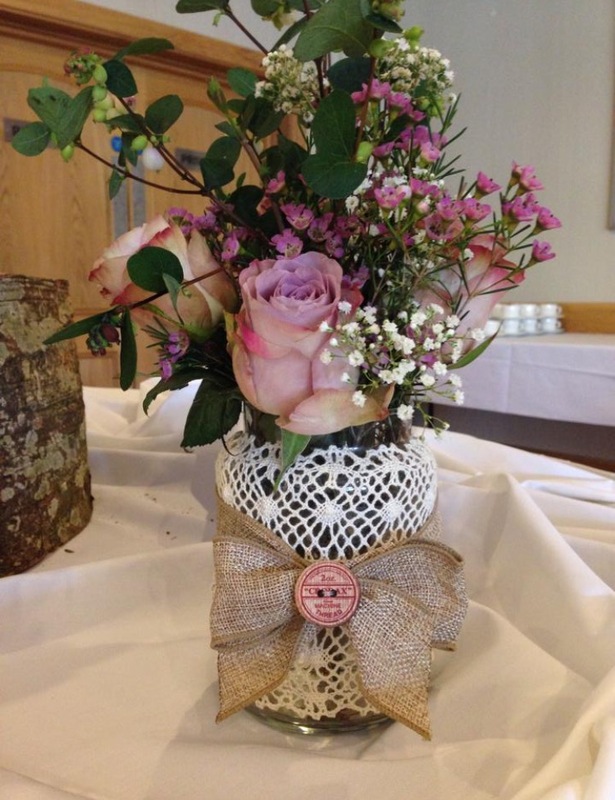 For a more rustic vintage look I have used crochet lace a few times and this was particularly effective in a vintage sewing themed wedding which I styled. 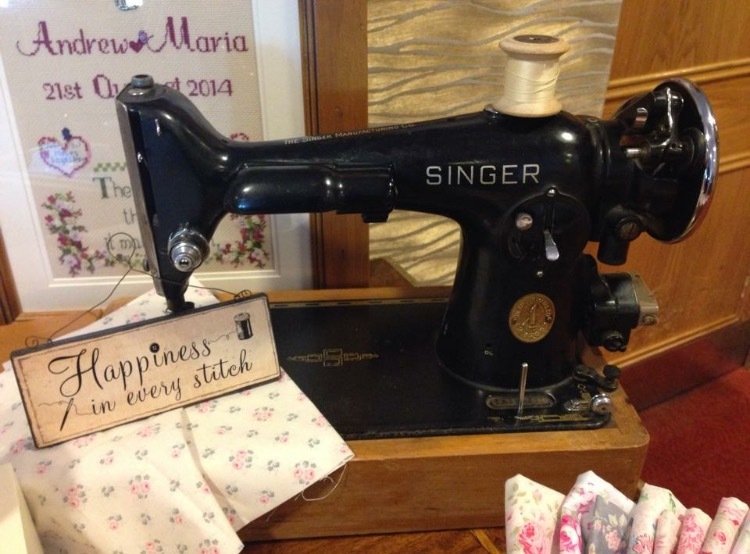 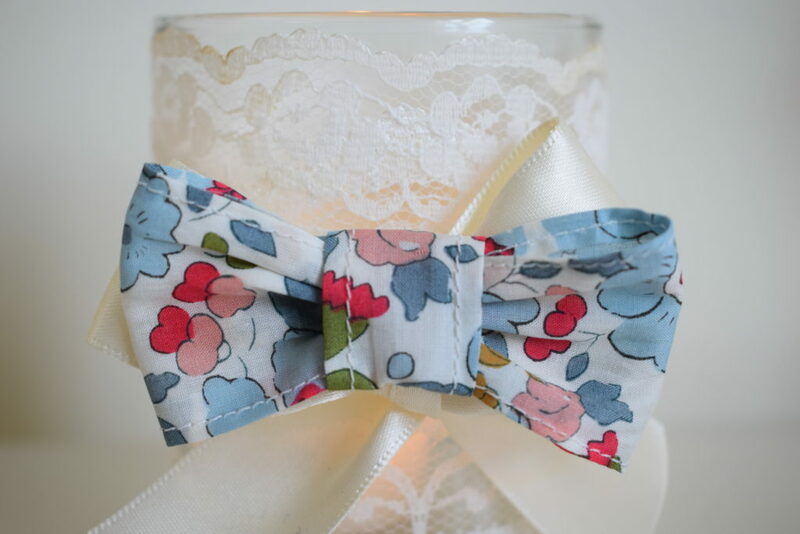 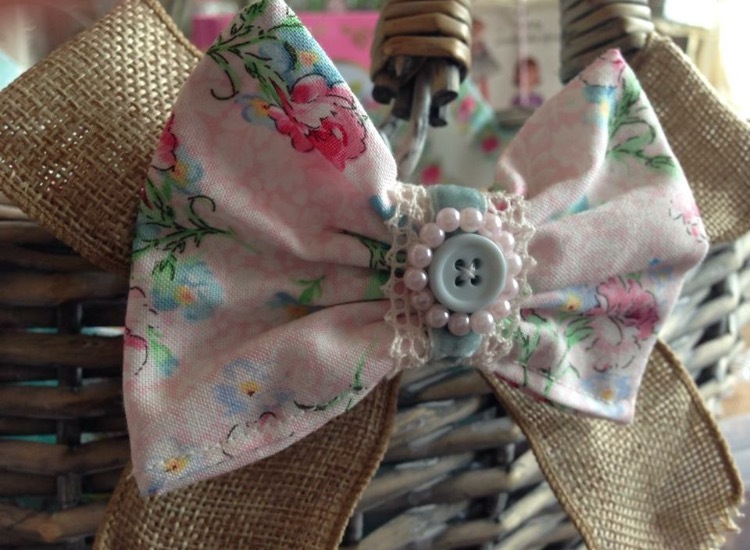 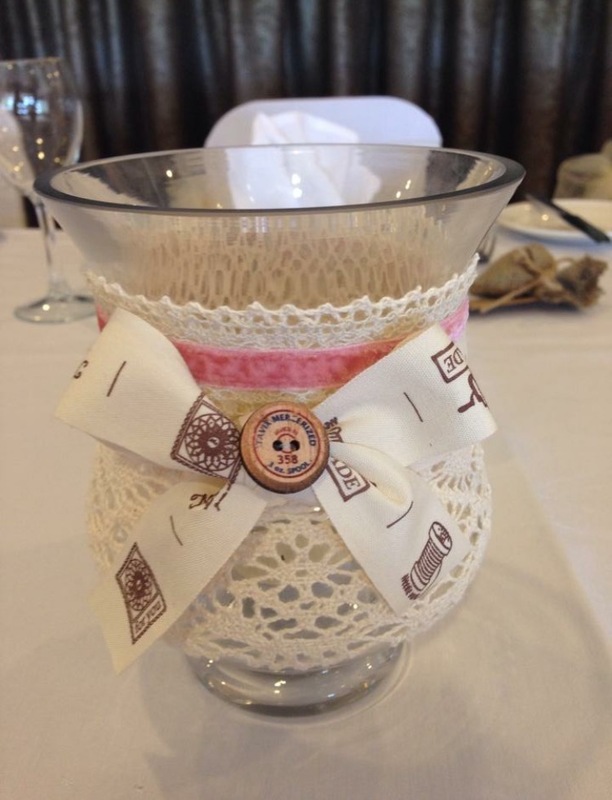 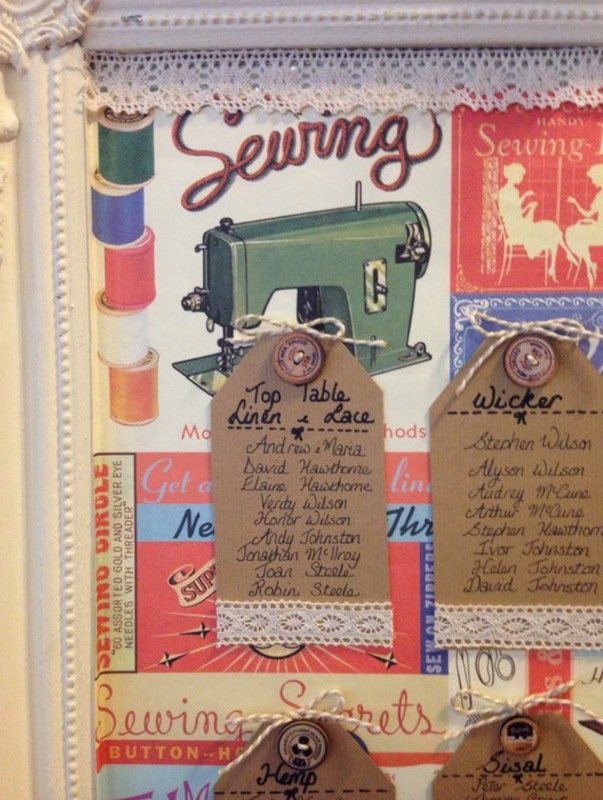 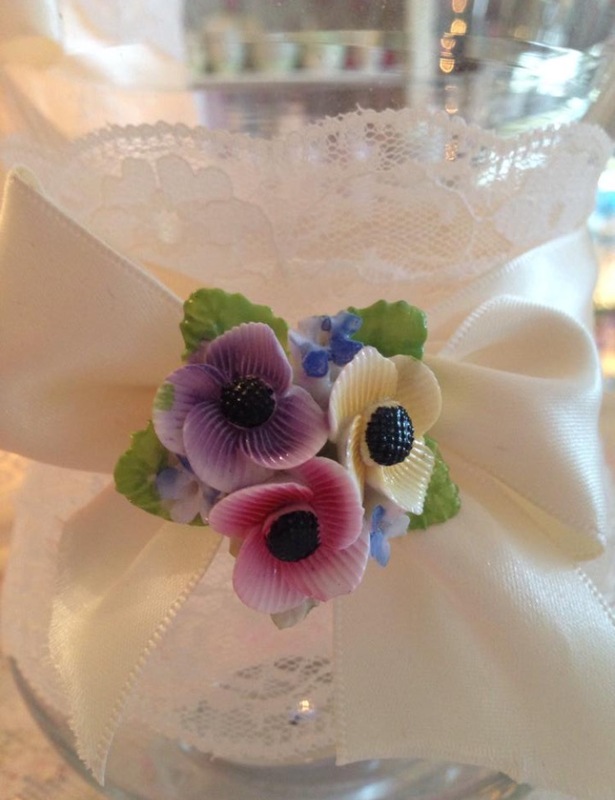 Instead of using brooches I sewed wooden buttons onto the ribbons and used the same buttons on the table plan. 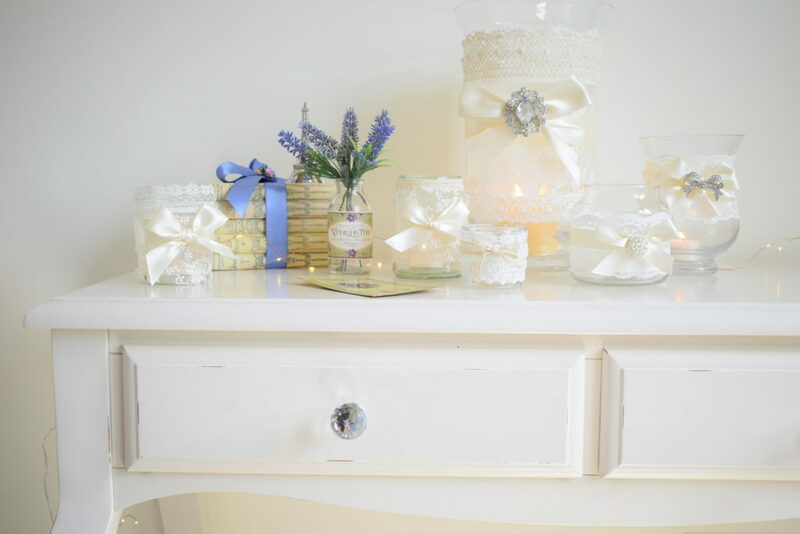 There were so many lovely details in this wedding that all tied together beautifully on the day. 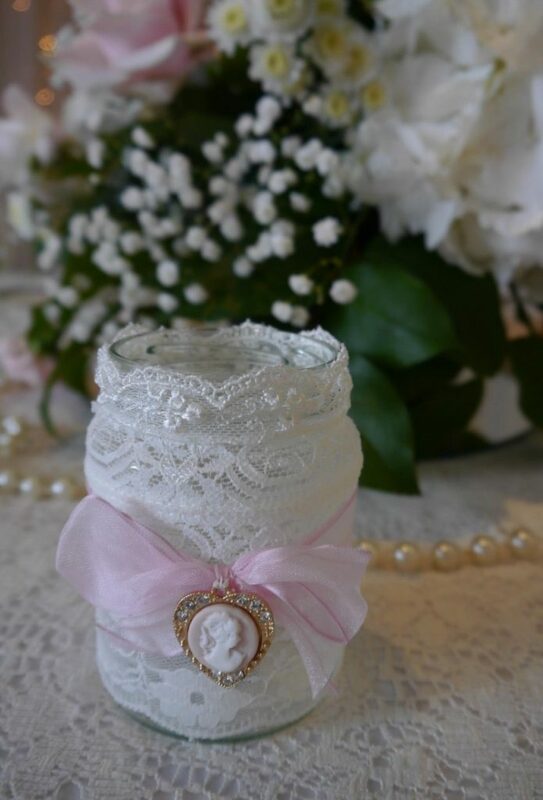 I always make smaller lace and fabric jars to match the larger ones and group the different sizes together on top tables and cake tables. 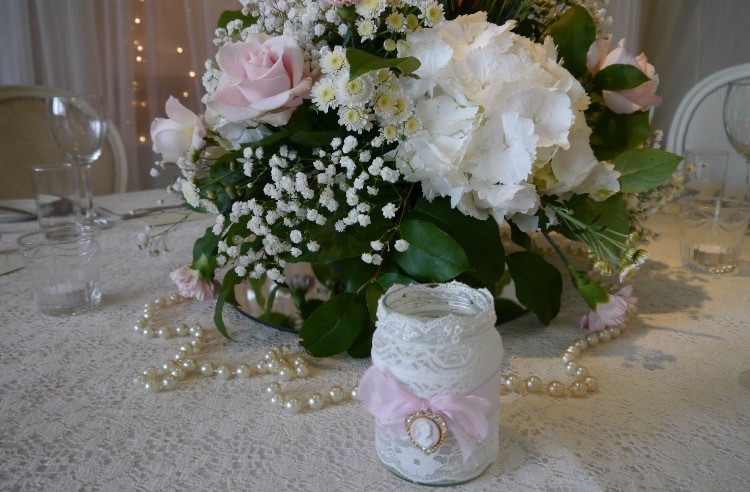 If a bride doesn’t want the long and low type floral display on her top table then little jars of flowers dotted along with candles and tealights looks very pretty and romantic but again it’s all down to personal choice. 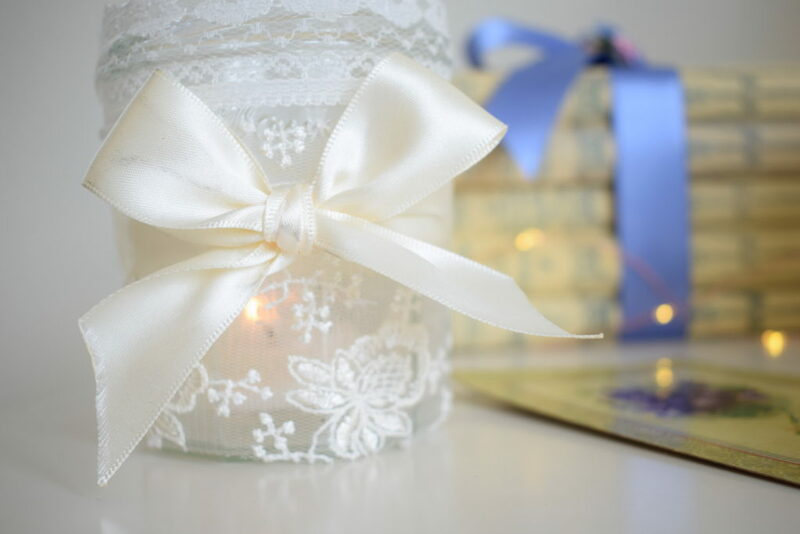 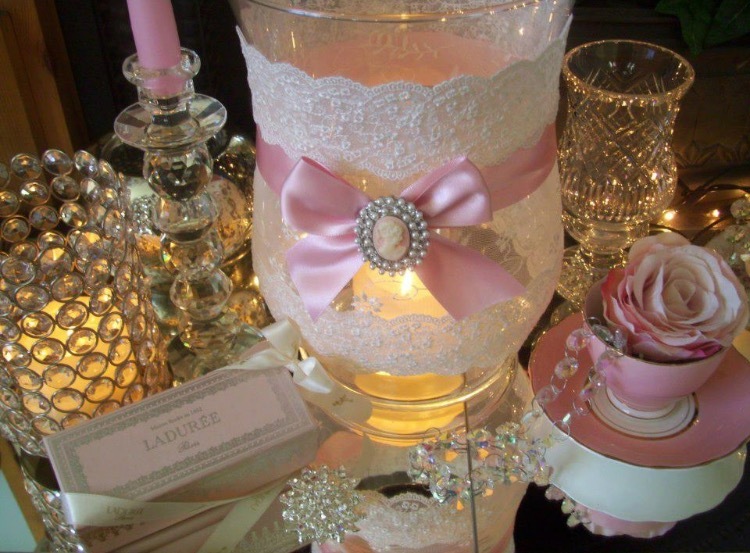 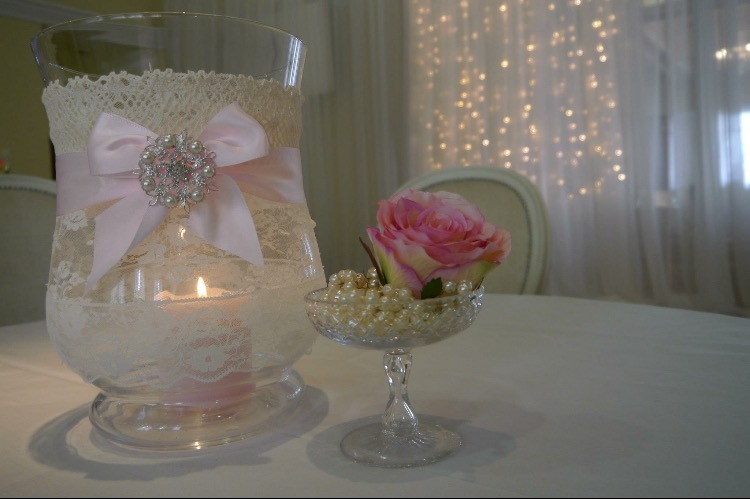 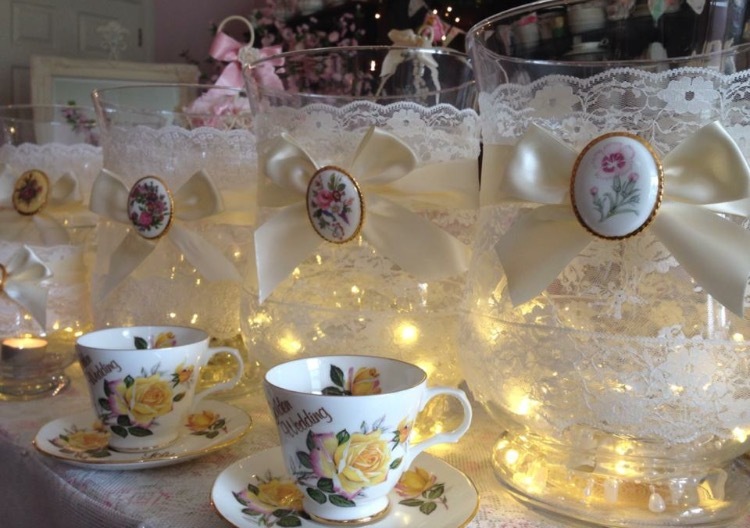 I hope I’ve managed to show you how our lace lanterns can be adapted to suit many different styles of events and how they can be displayed as part of any special occasion. 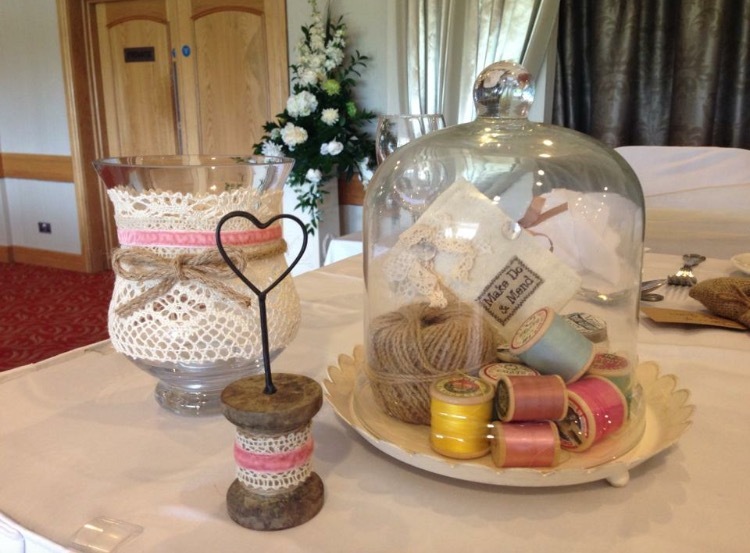 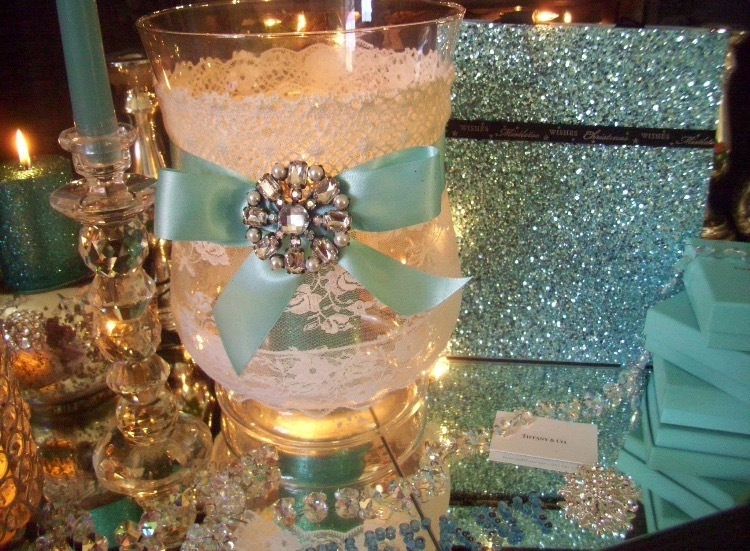 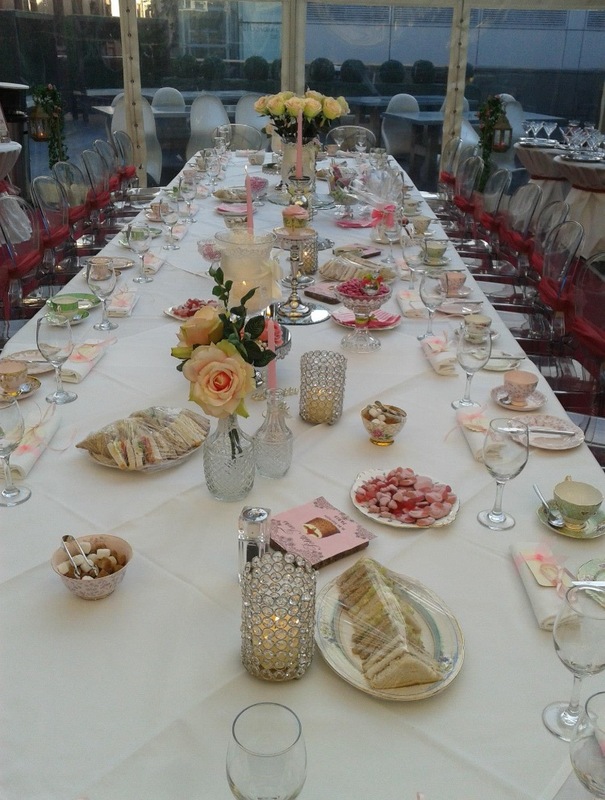 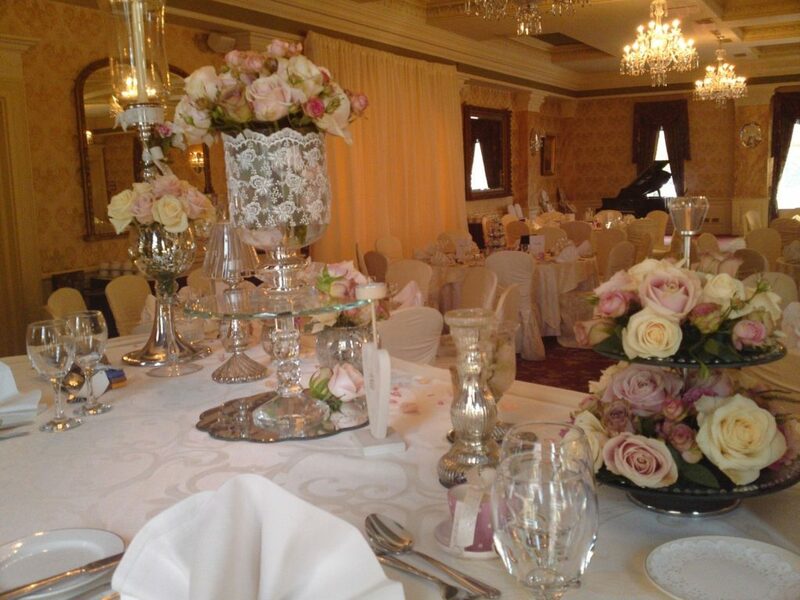 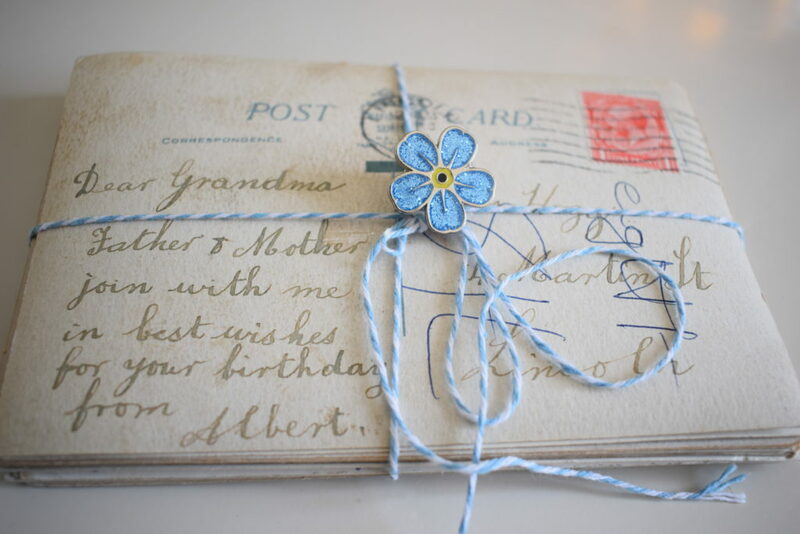 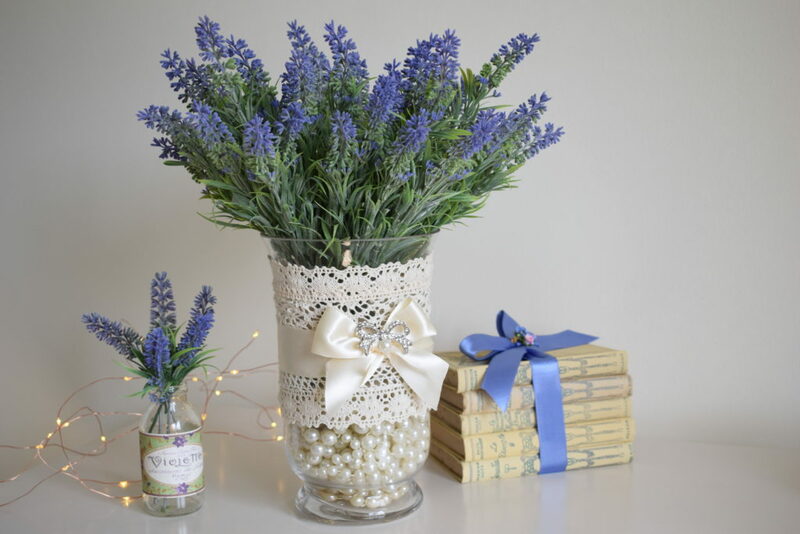 I feel they add a very unique touch to the decor of any vintage inspired day and the fact that they are tailor made to tie in perfectly with chosen colours and themes makes it even more special. 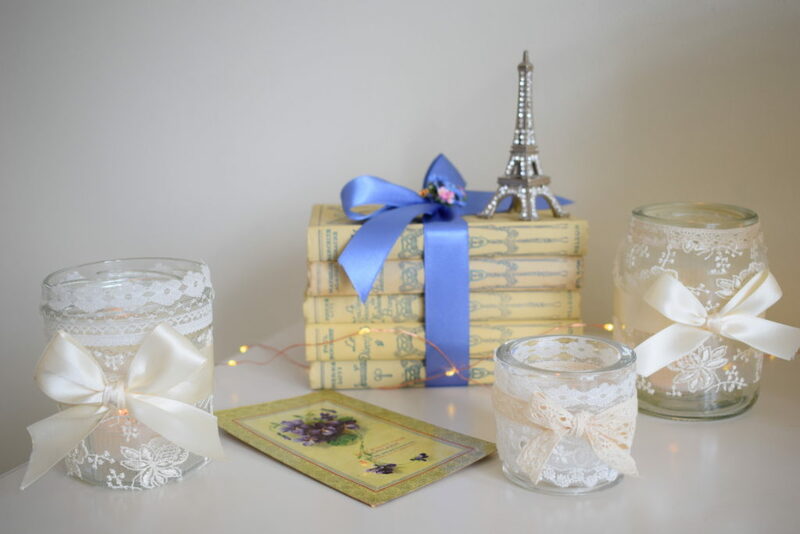 Thank you so much for reading, hope you’ve enjoyed! 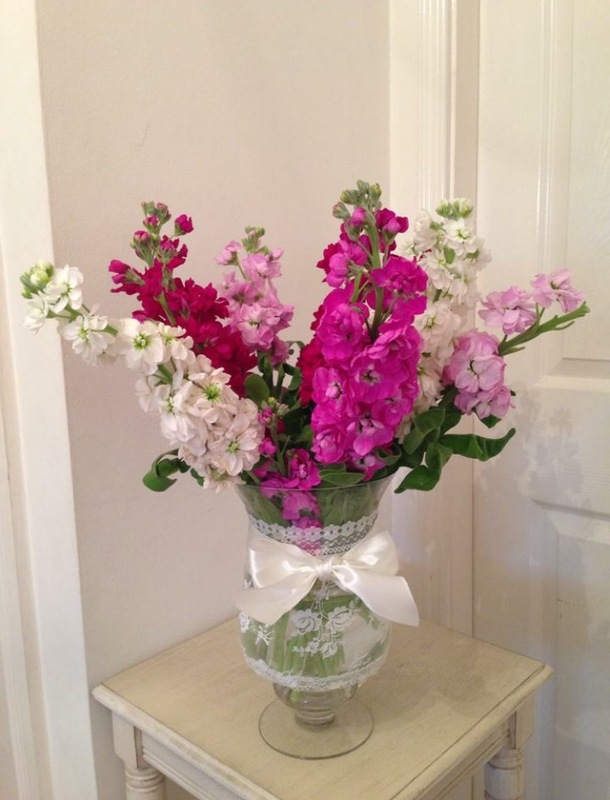 Thanks so much Jane, glad you enjoyed!